With thanks for the photograph to: Akhbarak at EgyptianStreets. Egyptians and Hijab Controversy regarding schoolgirls’ attire. The only moral flashpoint, for me, is any re-inforcement of cultural traditions, religious or not, which flag up a girl’s puberty. Females are already subjected to obsessive intrusion on their sexuality and how it should be kept under control or exploited. 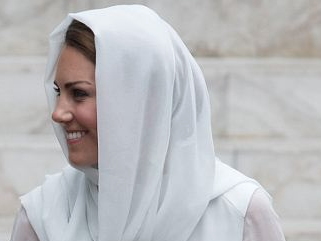 With thanks to the Daily Mail for pictures of some Royals wearing headscarves muslim -style! “Kate makes first visit to mosque – and wears veil and attire like her mother-in-law, Queen Elizabeth, wore 20 years earlier”.